The last 10 years we have seen drastic changes to the retail environment and no doubt the next 10 will be just as ground breaking with the many exciting, emerging technology trends and advancements. It is clear to see consumer trends have changed in recent years. Research shows that two thirds of shoppers changed their shopping behaviour during recent years. Spending started to slow down as people who used to make shopping lists now buy something because they have an email coupon or because a retailer has fast checkout lines. Scoopon in Australia and Grabone in NZ are two companies which have seen great success in online sales. In the new multichannel reality the boundaries between virtual and physical space are becoming blurred and retailers and being forced to question the function of stores. By 2020 non-store retail is expected to represent around 12% of the overall retail space with one third of retail growth coming from online sales. 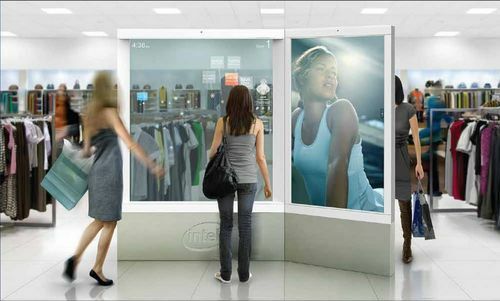 Disappearing checkouts, shrinking stores and hovering holograms with product information will be a thing of the future. Consumer electronic devices have evolved from occasional use devise to highly embedded tools in our everyday lives. According to the 2011 Nielsen report approx. 46% of all mobile users own a smart phone. Moving closer to 2020 we are likely to see more and more “pop-up shops”. A generation ago, supermarkets “popped” into fuller service environments with flower shops, coffee shops and wine sellers. Department stores added experiential areas and services, make-up counters began to offer more makeovers and demonstrations. This type of retail occupies a location for a short time and is promotional and creates hype, coolness factor and a sense of urgency or intrigue. After the Christchurch earth quakes of 2010 & 2011 the city has created a “popup city” as they wait to rebuild the city, with a hub of restaurants, cafes, bars and retail popping up all over the show. Over in the UK BoxPark Shoreditch is a retail innovation. The worlds first pop up mall, based in the heart of east London. No doubt we will see more and more of these types of stores in the next five to eight years. In August this year Woolworths launched Australia’s first drive through supermarket at Warringah Mall in Sydney, allowing customers to collect their shopping without having to get out of their car. The idea was pioneered by French food retailer Auchan in 2006. Tesco and Waitrose are also testing the model in England. In South Korea, Tesco created a virtual store in the subway where commuters can order their groceries from a virtual wall. As consumers will shop more often retailers need to capitalize on impulse needs with people picking up goods on a daily basis instead of weekly stock ups. Online retailers will partner up with non competitive retailers for places where customers can pick up their merchandise. Amazon have already started doing this when a customer purchases an item on Amazon, they can opt to have the item delivered to a locker where upon delivery they'll receive a email with a code that opens the locker. Burberry hosted a holographic fashion show in Beijing last year. Dozens of models walked across the catwalk where real-time video and generative computer graphics interacted with the models’ movements and clothes, resulting in a hybrid spectacle where the physical and the virtual could hardly be distinguished. Speed and convenience are two of the underlying factors affecting our retail environment and going forward innovation and social media (omni\-channel) retailing will be the major players in the retail environment. 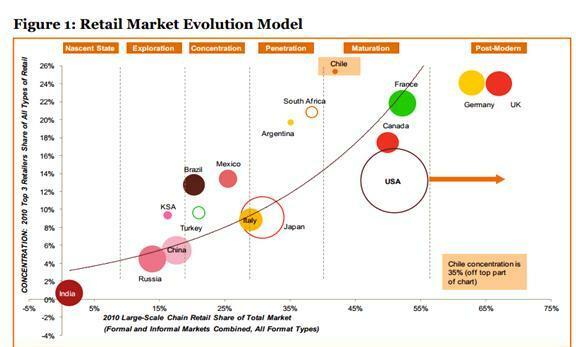 The movers and shakers of the retail market are shown in the Market Evolution Model below. It categorises each country according to their Retail Development Stage. Going ahead you can see that the US is yet to reach the post modern stage that Germany and the UK are at. India is miles behind everyone else, however, after allowing 100% FDI in the retail market this year we are likely to see them move into the exploration stage soon. One of the growing challenges will be to engage consumers so that they don’t feel like they are a victim of mass marketing. While innovation is great, service and bricks and mortar will ultimately be the differentiation factor for retailers.